Kanagawa, Japan, March 7, 2011 — As part of the ongoing expansion of its digital radio business, KENWOOD Corporation (KENWOOD) an operating company of the JVC KENWOOD Group, has announced the launch of new portable transceiver platform with a choice of three model types to suit different applications — latest additions to the NEXEDGE® digital radio systems marketed worldwide. KENWOOD’s communications business, one of the company’s key divisions, has the second largest share of the global market for professional transceivers — KENWOOD’s core products. In this field the shift to digital technologies has been gaining momentum, and in December 2007 KENWOOD started marketing NEXEDGE® digital radio systems that offer a soft migration path from legacy analog. Since then, NEXEDGE® has been expanded and new products have been added. Sales have been growing steadily, year on year, mainly in the business & industry market that includes radio services, hospitality/entertainment complexes, utility companies, technology campuses and multi-agency public safety systems. 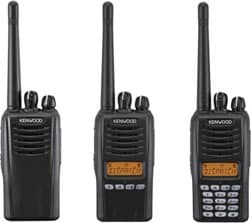 In order to further accelerate the evolution from analog to digital among users of professional communications equipment, and to expand its digital radio business, KENWOOD has announced the latest additions to its NEXEDGE® system line-up, which has mainly concentrated on high-functionality models. The new NX-220/330 portable transceivers represent excellent value and provide a choice of 3 models to address business/industrial and local government applications. While offering the same basic advantages of digital radio technology, such as inherent secured voice and increased effective coverage area, these two models are also very easy to set up and simple to operate. KENWOOD has been actively introducing NEXEDGE® systems worldwide to commercial and private operators who want the advantages of digital technology, but with traditional mandatory command and control. At the same time, the company is laying the foundation for achieving strong qualitative growth with investments centered on system solutions. NEXEDGE® is a registered trademark of KENWOOD Corporation in the USA, Japan and other countries. Advertising and Publicity, Strategic Corporate Planning Division, JVC KENWOOD Holdings,Inc.